One of the things I like the most about attending the Volvo Car Open tennis tournament on Charleston’s Daniel Island is watching the players as they leave the court after their games and the kids that gather around for autographs of balls, hats, books, and just about every object available. It is impressive to see how women’s tennis has grown in popularity and influence, especially for young people. It also shows how much fun and entertainment is offered in going to see the action. Since 1973, the Volvo Car Open has been a pioneer in women’s professional sports creating milestones that over the years have directly influenced the popularity of women’s professional tennis. The Volvo Car Open is the largest women’s only tennis tournament in North America. This year the tournament is set for March 30 -April 7. 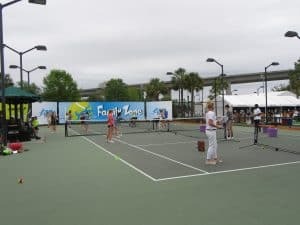 World class tennis players such as U.S. Open champion Sloane Stephens, world top ten players Caroline Wozniacki, Kiki Bertens, Madison Keys, and Julia Georges, along and many others including local Charleston native and fan favorite Shelby Rogers will be participating. Shelby Rogers signs autographs for the fans. The excitement isn’t limited to singles play as the week-long doubles competition features many world class duets as well as being fast paced and furious action. The fans at the doubles competition are also spirited with infectious enthusiasm! The tennis tournament has so much more to offer than just tennis with a variety of options for the whole family, especially the kids. There are always fun things to do for the children and parents. The first two days of the tournament Saturday and Sunday,March 30 and 31 feature activities such as a farmer’s market, sand piles with a sand castle sculptor, action packed rides from the state fair, Fortnite obstacle course, LEGO building station, petting zoo, face painting, balloons and much more. It’s free admission for kids 16 and under, and adults are only $10. If you go please try to bring a book to donate to 365Read, a Charleston program providing more opportunities for students to read. The men are not left out completely as on Saturday evening April 6 four legends of men’s tennis: Jim Courier, Andy Roddick, Mats Wilander, and Lleyton Hewitt will face off against each other in a mini round robin format as part of the Invesco Tennis Series. The Volvo Car Stadium is completely accessible to the disabled and has an elevator so all levels of seating have wheelchair or mobility challenged accessibility. Bring sunscreen, hats and sunglasses! A wide and varied assortment of food and drink vendors as well as club restaurants are available. The grounds have displays, tents , seating areas and outer courts where matches are held throughout much of the tournament. Ticket prices are reasonable and parking is convenient with buses taking guests to the stadium. Sponsor tents are located along the concourse and many have give-a-ways to promote their various products. 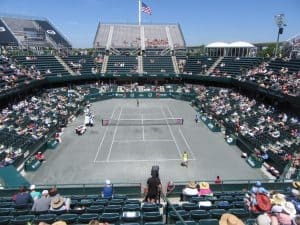 Enjoy a day or two of Women’s Tennis at the Volvo Car Open on Daniel Island (Charleston) at the Volvo Car Stadium and watch as the players in the Billie Jean King Stadium Court or the Althea Gibson Court master the clay surfaces that maximize the players athletic ability. Every seat offers a clear view. You won’t be disappointed. So enjoy!